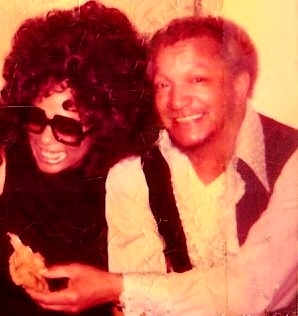 Redd and Linda Griner aka Lyn Roman HAD A SPECIAL BOND HE WAS FAMILY. They shared a great sense of humor together and made life funny no matter how hard things were this is priceless! All the time traveling on the road touring together. Here he’s teasing her telling her not to be so Prissy and eat the damn fried chicken with her fingers. Don’t miss the ” Redd Foxx Documentary “Commemorating his passing 25yrs. Jamie Foxx producer ” The Foxx Hole Stay tuned will be aired multiple times during dates below. The Foxxhole presents Redd Foxx: We’ve Come To Join You, an audio documentary chronicling the life and career of a American icon. The Foxxhole presents Redd Foxx: We’ve Come To Join You, an audio documentary chronicling the life, career and legacy of entertainer Redd Foxx. This documentary gives an unparalleled look into Redd’s life through commentary from comedians Paul Mooney, George Wallace and Eddie Griffin; Redd’s sister-in-law Linda Griner; singer and actress Della Reese-Lett; and producer of the Redd Foxx Comedy Hour. http://lindagrinermusic.com/wp-content/uploads/2016/08/logo.jpg 0 0 admin http://lindagrinermusic.com/wp-content/uploads/2016/08/logo.jpg admin2016-10-08 12:55:562016-11-29 17:27:58Redd and Linda Griner aka Lyn Roman HAD A SPECIAL BOND HE WAS FAMILY.